FUN! There will be great music, raffles, unique art items to bid on and great company as well! FOOD! Discover new treats from Detroit chefs to tantalize your taste buds. FUND! Support the Detroit community and help GLS educate children and businesses for a greener Detroit. 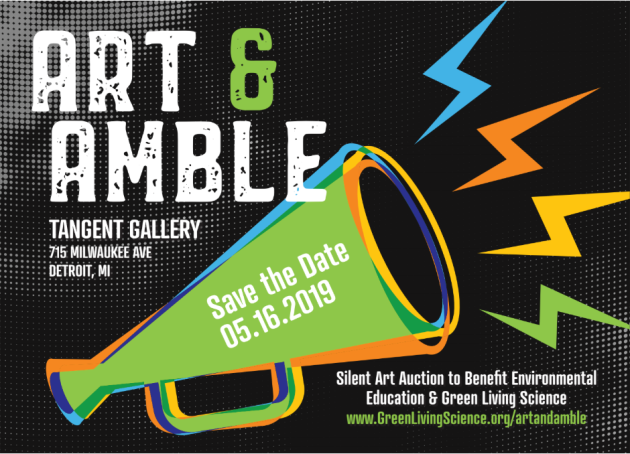 Art and Amble is a ticketed event that invites guests to bid on art donated by local artists in a silent auction and taste delicious food prepared by the best Detroit chefs as they amble through the Tangent Gallery. The goal of the evening is to bring together the emerging Detroit food and art scene to benefit environmental education in Detroit Public Schools Community District. GLS is a 501(c)3 nonprofit organization. Our mission is to educate and create a greener Detroit by expanding curbside recycling at home as well as at schools and businesses. When we started this work, Detroit was the largest metropolitan area in the country without any curbside recycling. We now have 27% of households in Detroit with a curbside cart. Last year we worked with 30,000 students by providing lessons, assemblies, field trips and our own summer camp at Recycle Here. GLS has signed up over 15,000 households for curbside recycling, by attending community meetings all over the city. This is a year-round, non-stop effort to educate and make Detroit a cleaner and more sustainable place.